Suspension seems to be a loaded term these days, especially when used in descriptions of the piaffe. 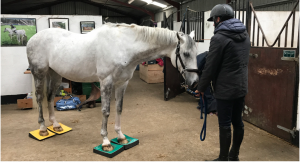 In this column we’ll look at the biomechanical definition of suspension, which gaits have it and which don’t, and how its presence or absence affects the horse and rider. Next month we’ll go a stage further in exploring the controversy about what really happens in the piaffe. Let’s begin with a definition. In biomechanical terms, a suspension is a period when the horse is airborne and has no limbs in contact with the ground. Normally, during every stride each of the four limbs has a supporting phase when it is on the ground and a swing phase when the hoof loses contact with the ground as it swings forward through the air. Suspension implies that all four limbs are in the swing phase simultaneously. In gait terminology, the presence or absence of a suspension differentiates leaping (or running) gaits from stepping (or walking) gaits. This distinction is more than purely academic. As we’ll see later, the horse’s body moves over the limb somewhat differently in a leaping gait than in a stepping gait, and there’s a whole world of a difference in the way it feels to sit on a leaping versus a stepping gait. The walk is always a stepping gait and so it has no suspension. In the walk the horse alternates between periods of support by two limbs and by three limbs. The trot and canter are leaping gaits. The trot has two suspensions in every complete stride, one following the stance phase of each diagonal pair of limbs. 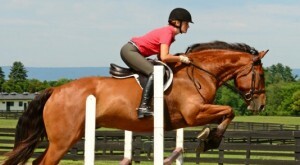 The canter has one suspension phase in each stride, and it follows lift off of the leading fore limb. It is described as a gathered suspension because all four limbs are gathered up under the horse’s body. Other animals that have a more flexible vertebral column, such as dogs and cats, show two suspensions in each gallop stride; a gathered suspension similar that seen in the horse and an extended suspension in which the legs are stretched out behind and in front of the body. 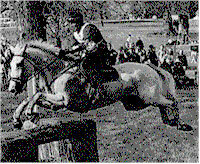 Horses occasionally show an extended suspension at full gallop, and during jumping horses use an extended suspension to get airborne over the fence. It is a general characteristic of locomotion that, as speed is reduced, each limb spends longer in the stance phase with a consequent reduction in the swing phase. The reason is that, at slower speeds, the horse needs better balance. Stability is improved by having more limbs in contact with the ground. At faster speeds the forward motion compensates for the loss of stability. 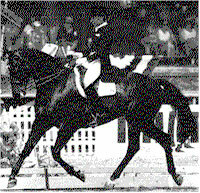 Consequently, although the trot normally has two suspensions in every stride, a very slow trot may not have a suspension, instead the horse steps from one diagonal to the other. This is exemplified by the jog trot of the Western Pleasure horse. 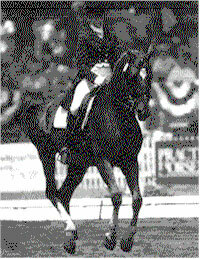 In dressage horses the suspension becomes very short in the collected trot and canter. The presence or absence of suspension affects the way in which the horse alters stride length, for example, in the transition between the collected and extended gaits. In the walk, since there is no suspension, the length of stride that can be achieved depends on the horse’s ability to stretch through the body and rotate its limbs through a wide arc of motion. The key in the walk is to maximize over-tracking without interfering with the rhythm. In the trot and canter, most of the increase in stride length from the collected to the extended gaits occurs during the suspension. The longer the horse stays airborne, the more ground is covered during the suspension which translates into a longer stride. The duration of the suspension depends mostly on the amount of lift. 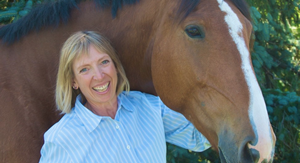 The more vertical velocity a horse has as he bounces off the ground into the suspension, the longer it takes for gravity to overcome the upward movement and pull the horse back down to earth. Therefore, a horse that has the appropriate conformation and muscular development to generate a lot of lift will display ground-covering extensions. The presence of a suspension also affects the rider. In gaits with no suspension, it’s easy to sit still in the saddle and follow the movement; even a complete novice can sit the walk. All the so-called easy gaits, such as the running walk or the foxtrot, are 4 beat gaits that are characterized by not having a suspension – hence the ‘easy’ ride. 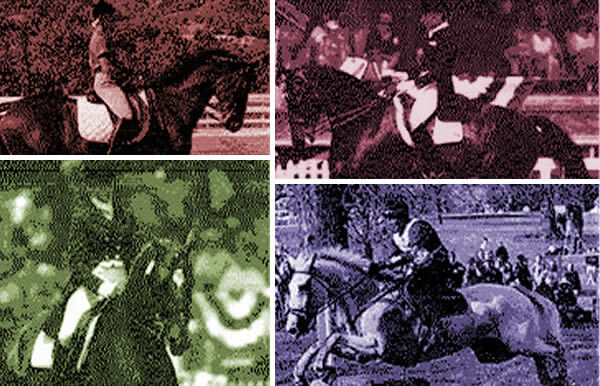 It is the presence of a suspension that presents a challenge to the rider in terms of following the horse’s movement in a controlled manner. 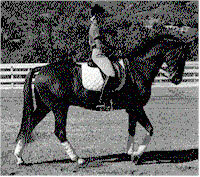 The reason why it is more difficult to avoid bouncing in the saddle during the extended trot than in collected trot should now be obvious; in the extension the horse creates a longer suspension by projecting itself higher into the air, so the rider has to work harder to follow the vertical motion.